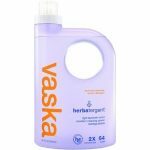 As a result of my efforts to live in a way that loves our earth and is human friendly, I discover a wide variety of brands who design their cleaning products to be gentle on our skin and our environment. I first learned about Rockin Green not too long after I started cloth diapering our boys. I heard it RAVED about (let me tell you, Rockin’ Green has some fans who are very passionate about their soap!) on cloth diaper pages. I decided to try some for myself. –Man, that was a while ago! Can you believe Oh So Savvy Mom has been around that long?– And I’ve been using it off and on ever since. Recently, Kim from Rockin Green Soap asked me if I would consider reviewing some of the products Rockin’ Green has available. 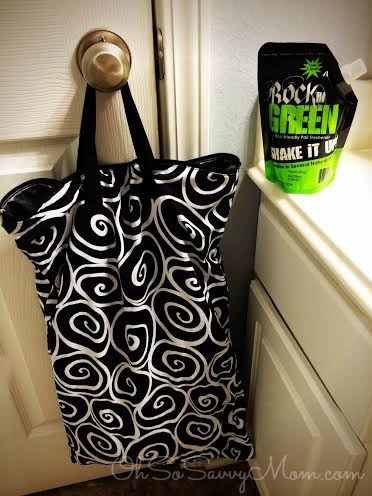 I was surprised to learn then, that Rockin’ Green has expanded their product line to include not only cloth diaper safe laundry detergent, but also Pet Toy and Bedding Detergent, Athletic Wear Detergent, Femme Rock for mama cloth wearers, Odor Neutralizer Spray, and Dishwasher Detergent! Cool beans! 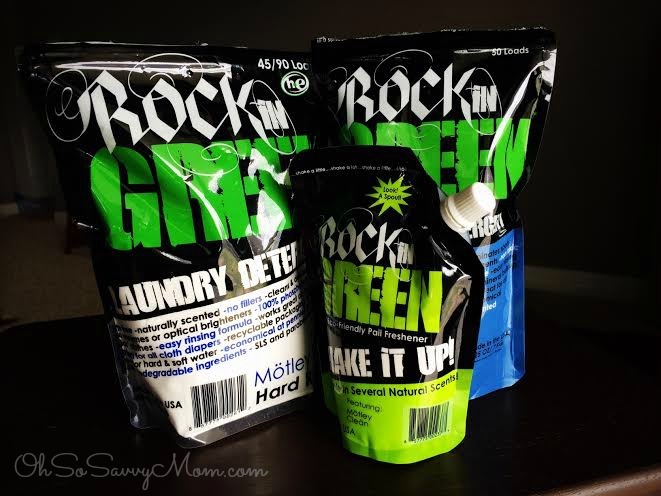 I received Rockin’ Green Hard Rock in my favorite scent, Mötely Clean, Shake It Up Pail Freshener in the same scent, and the Dishwasher Detergent. 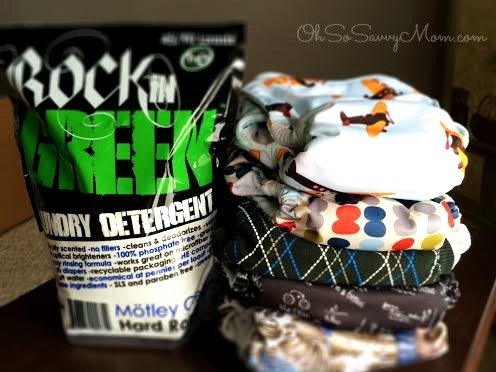 Rockin’ Green laundry detergent can be used to wash any laundry, not just cloth diapers. Rockin’ Green detergent comes in three different formulations for hard, soft, and standard water. If your diapers start to get smelly for one reason or another you can “rock a soak” in the detergent or their specially formulated Funk Rock. I’ve talked about washing cloth diapers in my HE top loader before. Finding the perfect routine is completely possible, but does take a little practice. To see a general overview of my wash routine click the link above. Because we have moderately hard water I use the Rockin’ Green Hard Rock (Motley Clean is my favorite scent!) The instructions on the back of the bag recommend that standard washing machine users use 2-3 tbsp per load while HE users use 1-2 tbsp per load. I, however, found that if I used any less than 2 tbsp I started to get stink in the diapers. 2 1/2 tbsp seems to be the sweet spot for us. The Shake It Up pail freshener is great for when your wetbag or pail starts to get a little smelly. If you wash every other day and have the perfect laundry routine for beautiful smelling diapers you may not have a problem with pail or wetbag odor. However, if you’re like me and only wash every three days you may get a little bit of smell. Probably most important: Leave your wetbag or pail open to the air. While it might seem counter intuitive to leave a bag of smelly, pee pee diapers open, you’ll find that the diapers will get a LOT stinkier a LOT faster when you close up the bag. Bacteria (and ammonia too, apparently) like warm, moist places. Leaving your wetbag open, or pail lid cracked, as long as you can in between washings. Sprinkle a little Shake it Up pail freshener when stinkies start to creep up. Now that we’ve talked about laundry let’s talk dishes! So, I tried a natural dishwasher powder once before and HATED it! After 3 loads of dishes coming out of the “clean” dishwasher totally cloudy with food remnants dried on I gave up and banished that detergent to the back of my cleaning cabinet. With resignation I went back to my tried, trusted, albeit not-so-eco-friendly dishwasher detergent. I wasn’t expecting to be amazed when I ran a load of dishes using Rockin’ Green Dishwasher Detergent, yet amazed I was! I am delighted to let you know that my dishes come out of the dishwasher just as clean when I use Rockin’ Green Dishwasher Detergent as they do when I use Finish detergent (one of the heavier duty, pricey dish detergents). I’ve been using Rockin’ Green Dishwasher Detergent for the past month and I am still getting great results! Check out RockinGreenSoap.com for all their great products, prices, and to find where you can purchase in a store near you. While you are there make sure you sign up for their rewards program to start earning savings off your purchases! You can follow Rockin Green Soap on Facebook, Twitter, and Pinterest. Never heard of this before but like the name of it. Kind of catchy. Would like to try it out soon. i've been hearing about this lately , i will have to try it!!! Haven't heard of either but it looks like something I should try. Oh, I LOVED this for our cloth diapers. Such a great smell. I've tried their soap when I clothed diapered my second kid. I didn't know they had a dish detergent though! Great to hear it worked just as well for you! I too have been hearing a lot about it! Ill have to try it! Great stuff for sensitive skin! And it works awesome! It's safe, gentle, but yet powerful! I love this stuff!! I have not heard of this brand before, glad it's working well for you. I will have to check it out.